PARIS -- Renault said first-quarter revenue fell 9 percent on declining European demand as the car industry struggles with a sluggish economy in the region and overcapacity. Revenue decreased to 9.54 billion euros ($12.6 billion) in the first three months from 10.4 billion euros a year earlier, the company said. Sales volumes fell 7.9 percent to 638,498 units due to a very unfavorable market in Europe, Renault said. Renault results suffered from comparisons with a year-ago period boosted by scrappage incentives for car buyers to trade in old vehicles for newer vehicles. "The European market, and the French market in particular, was weaker than expected," Renault said in a statement on Wednesday. "The fall in the European market is expected to slow in the second quarter." Renault's domestic deliveries declined 25 percent in the first quarter from a year earlier, France's automakers' association CCFA reported earlier this month. The company's registrations in the 27 EU countries plus Switzerland, Norway and Iceland fell 23 percent over the same period to 281,969 vehicles, according to industry association ACEA. 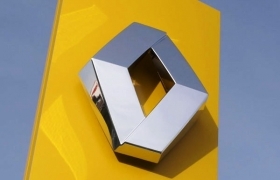 Renault confirmed its full year objective of generating a positive automotive operational free cash flow in 2012, with a ratio of capital expenditures and r&d below 9 percent of group revenues. Renault expects 2012 deliveries worldwide slightly higher than last year's result as gains markets outside Europe and the introduction of new nine new models helps boost demand, sales chief Jerome Stoll said during a presentation for analysts. He said Renault is still targeting 3 to 4 percent global full-year sales growth. Stoll said the company expected some measure of sales growth in the second half, while global first-half sales would likely be flat from a year ago. French rival PSA/Peugeot-Citroen said earlier on Wednesday that its first-quarter revenue fell 7.3 percent to 14.3 billion euros. The automaker reiterated forecasts that the European market will shrink 5 percent this year, including a 10 percent drop in France. Both automakers are suffering from a reliance on the plunging French, Italian and Spanish auto markets. Renault said its home French market contracted by 19.4 percent in the quarter. Neither companies held out much hope for improvement until before the second half. Both companies are trying to boost their exposure to emerging markets like Latin America and Asia to offset European weakness. PSA generates 42 percent of its sales outside Europe, compared with Renault, which derives 46 percent of its sales outside the continent. PSA plans a push into China and an alliance with U.S. automaker General Motors designed eventually to cut $2 billion of the carmakers' annual costs. Renault signed a memorandum of understanding with Dongfeng Motor Group to form a Chinese joint venture to build vehicles for the world's largest auto market, the company said this week. European automakers will continue to weaken if they're not allowed by governments in the region to restructure and cut jobs, Renault CEO Carlos Ghosn said at an automotive forum in New York on April 3. "Different countries in Europe are not encouraging at all the restructuring of the industry," he said. Executives estimate overcapacity is about 20 percent on the continent.